The gang and I have been very busy lately with all the GAINZ and competing that we’ve been partaking in. 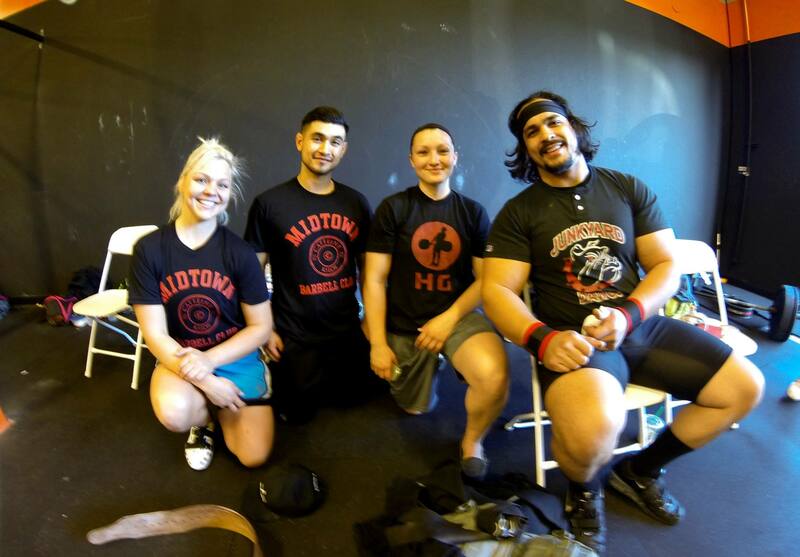 Just yesterday I coached eight lifters in one session at Hassle Free Headquarters (Sacramento). I had to change the system that use while counting attempts for lifters simply because there was too many of us. It worked out well. I think I’ll use this new system again whenever I have 4 or more lifters in a session. 1) I’ll group lifters together based on the numbers they’re lifting (2 or 3 to a group). These lifters will then be assigned to a bar/platform. 2) On one sheet of paper, I’ll write down the warm up sequence of each person in that group with the corresponding number of “attempts out” next to their sequence. 3) I’ll then run back and forth like THIS from the card table to the warm up room shouting how many attempts each lifter is out and leave it up to them to load and lift their weights at the correct time. The hardest part about this is making sure everyone is on the same page with what this actually means and that they pay attention to the bar drops on the competition platform to keep count. For instance, if I yell to Dean that he’s 17 out and he takes his next weight at 15 out, then he needs to wait 2 drops on the platform before he lifts his next weight. Me and a few of my peeps at a contest in Napa. Contest strategies aside, I’m extremely proud of all my lifters. They’ve been killing it. Definitely no cupcakes over here. The progress the’ve been making lately is due to their relentless work ethic and adherence to my program. No one who pays me for coaching thinks that they’re too cool to follow the program and when there’s an injury or restriction, we’ve been able to work around it. We’re definitely building up the number of lifters that will come with me to national meets. But it’s been a fun process lately and I’m proud to be taking part in it.